Books that unsettle and unnerve the reader have a tendency to be more memorable than light, frothy stories that amuse and delight. Juno & Hannah falls firmly into the first category, weaving an eerie tale set, for the most part, in the New Zealand wilderness. This dark and powerful book touches upon a number of serious issues in a high gothic style. Even in its simplest, more straight-forward scenes there is a sense of the eerie permeating the novella. When Hannah decides it’s time to flee a Christian community for the sake of her mentally disabled sister Juno, it’s hard to predict where their journey will take them. The chain of events is set in motion after Hannah helps a stranger on the riverbank. Her actions to save his life are considered necromancy and she is punished through seclusion. In her absence, Juno’s quirks draw less tolerance and moves are made to take the 14-year-old girl from the community. The two quickly make their escape through dense bushland and the wildness of nature becomes a metaphor for the chaotic forces at play in their own lives. The bush is almost a character in itself and is portrayed in a high gothic style. Its treatment is vaguely reminiscent of Jean Rhys’ Wide Sargasso Sea, where nature becomes a dangerous element, lush and exotic but unpredictable. Nature cannot be restrained or made to conform to society’s wishes, mirroring Juno’s own struggles with the world. The tale is set in 1920 but in a way it’s oddly timeless. With most of the action occurring in the deepest bush, the narrative could take place in a range of time streams. 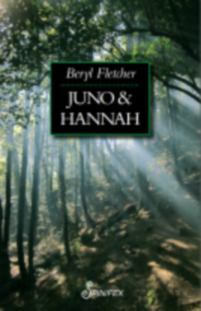 The use of the Christian fundamentalist society means Juno and Hannah’s lifestyle in anachronistic in its nature, regardless of the actual time period. While Fletcher does not delve too far into the Christian community, the hints at their lifestyle are enough to be chilling. This adds to the gothic feel of the novella, heightening tension. Beryl Fletcher won a Commonwealth Writers Prize for her first book in 1992 and Juno & Hannah provides further proof of her skill as a writer. Despite its gothic style, the novella never slips so far into melodrama as to become farcical. Fletcher retains a careful balance throughout the tale in a way that evokes both the uncertainty of the bush and its unnerving stillness. Even in moments of inertness, there’s a feeling that things could spiral out of control at any moment. Characters are multi-faceted and the reader, much like Hannah herself, finds it hard to figure out who can be trusted as the story progresses. The difficult issue of eugenics becomes a key part of the story in a stunning way. The novella paints an uncomfortable picture of attitudes towards people with mental disabilities which rings true even in today’s society. Characters in the story aren’t entirely sure how to treat Juno and her lack of comprehension of many things leads to infantilising treatment by the people in her community. It is only Hannah that takes a deeper interest in Juno. For most other characters, Juno is more seen as a problem than a person and steps are taken to come up with a solution. Importantly, Fletcher imbues Juno with a distinctive personality, preventing her from falling into a stereotype of otherness. While childlike in many ways, Juno is also capable of playing a role in plans regarding her own destiny and her emotions are written in a way that is raw and real. The novella is told through the eyes of Hannah but yet she also remains fairly enigmatic. Although she is the real protagonist of the novel, the bulk of the action directly relates to Juno. Almost all of Hannah’s actions stem from her desire to help her sister. It’s not a book that paints an easy picture of life as a woman and it’s hard to imagine what kinds of lives Hannah and Juno will go on to lead. Apart from Hannah’s decision to leave their community, the girls appear to have little say in their own destinies. In fact, in many ways the narrative is about Hannah’s struggle to take charge of their lives in the face of many parties who believe they know best, including their own father. This is not a story that neatly ties up all the loose ends into one happy little bundle and for that I profoundly thank Fletcher. It would have been a disservice to the complexity of the tale to provide a bland and simple ending. As it was, the questions raised by the narrative linger long after the book has been put down. This entry was posted in Beryl Fletcher, Issue 10, Juno & Hannah, Spinifex Press, Victoria Nugent and tagged Australian Fiction, Australian Literature, Beryl Fletcher, Commonwealth Writers Prize, Jean Rhys, Juno & Hannah, Novella, Spinifex Press, Victoria Nugent, Wide Sargasso Sea by Mark Roberts. Bookmark the permalink.